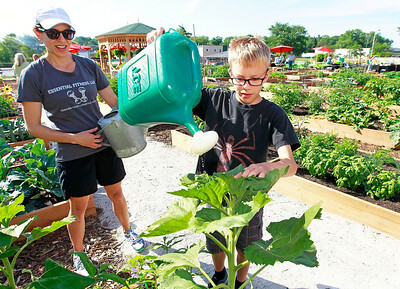 Candace H. Johnson Linnea Pioro, of Fox Lake guides her grandson, Kyle Taber, 8, on how to water their vegetable plants at the Community Garden of Fox Lake on Forest Avenue. 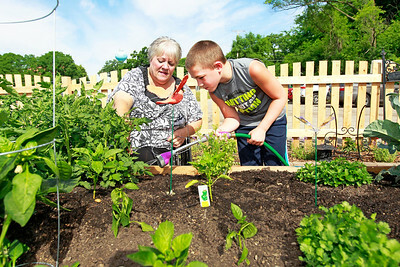 Candace H. Johnson Linnea Pioro, of Fox Lake helps her grandson, Kyle Taber, 8, water some of their vegetable plants on a double raised garden bed at the Community Garden of Fox Lake on Forest Avenue. 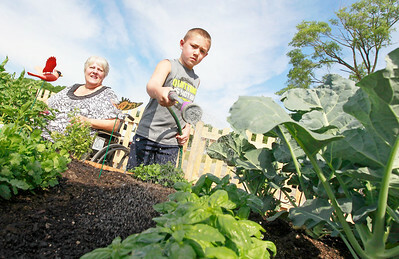 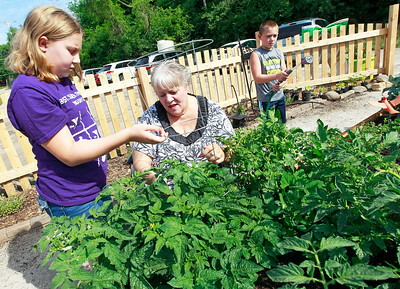 Candace H. Johnson Melanee Taber, 10, works with her grandmother, Linnea Pioro, and brother, Kyle, 8, all of Fox Lake, on their vegetable plants at the Community Garden of Fox Lake on Forest Avenue. 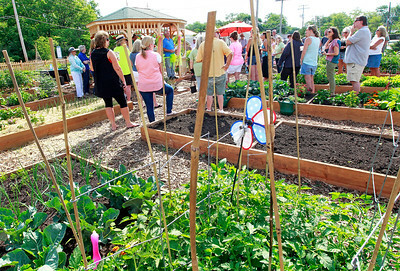 Candace H. Johnson Mayor Donny Schmit talks to the crowd before the ribbon cutting ceremony in the gazebo at the Community Garden of Fox Lake on Forest Avenue. 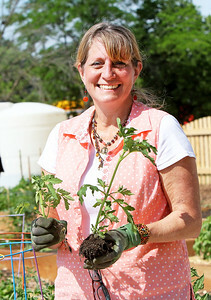 Candace H. Johnson Monica Marr, of Fox Lake holds up a tomato plant from her garden and a possible weed at the Community Garden of Fox Lake on Forest Avenue. 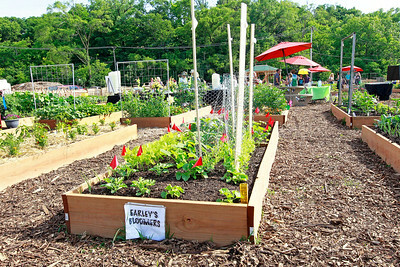 Candace H. Johnson The Community Garden of Fox Lake on Forest Avenue. 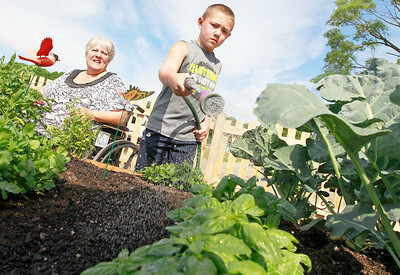 Candace H. Johnson Jobi Ledger, of Ingleside watches her son, James, 9, water their organic vegetable plants at the Community Garden of Fox Lake on Forest Avenue. 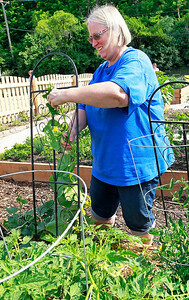 Candace H. Johnson Joyce Padera, of Fox Lake puts a cucumber plant on a trellis at the Community Garden of Fox Lake on Forest Avenue. 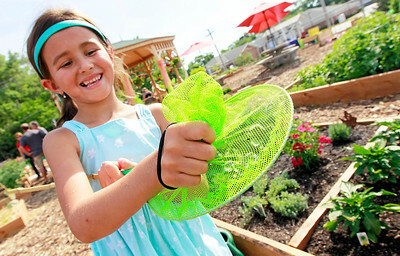 Candace H. Johnson Carolena Moore, 6, of Fox Lake catches a cabbage butterfly at the Community Garden of Fox Lake on Forest Avenue. 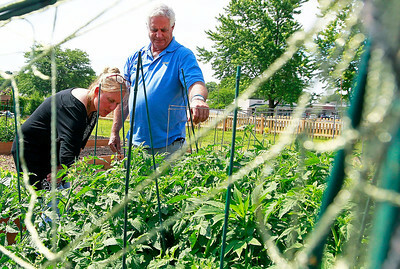 Candace H. Johnson Annemarie Toby, of Fox Lake, master gardener with the University of Illinois Extension, helps Donny Schmit, mayor of Fox Lake, with his vegetable plants at the Community Garden of Fox Lake on Forest Avenue. 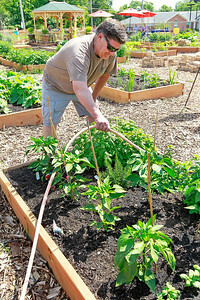 Candace H. Johnson Ed Noga, of Fox Lake waters his vegetable plants at the Community Garden of Fox Lake on Forest Avenue.